The South American or common squirrel monkey (Saimiri sciureus) is one of five species of squirrel monkey. This arboreal primate lives in rainforests throughout South America. The common squirrel monkey has fur that's orange and golden brown with a mask of white around the eyes. Only about a foot tall and weighing around 1.5 pounds, this small animal is vulnerable to many predators. 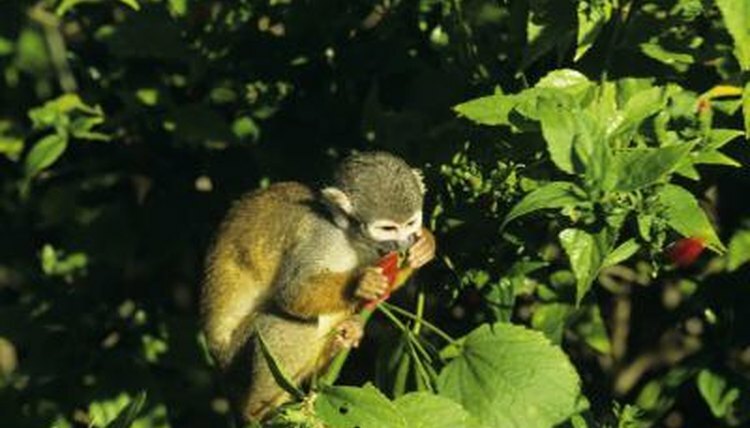 Carnivorous birds are the top predators of common squirrel monkeys. Day-active raptors that live in South American rainforests fly slowly over the treetops, relying primarily on their eyesight to reveal potential prey through the branches of the trees. Birds of prey that share the same habitat as common squirrel monkeys include caracara, falcon, vulture and condor species. Many species of snakes, particularly boas, call the South American rainforests home. These large constrictor snakes, including boa constrictors, tree boas and anacondas, lie in wait in the trees until an animal comes near. Once the potential prey is within reach, the constrictor coils its body around the primate’s body and suffocates it before swallowing it whole. These snakes commonly consume many small rainforest mammals, including the common squirrel monkey. Jungle cats, including jaguars and ocelots, also prey on common squirrel monkeys. These cats tend to be nocturnal, hunting primarily at dusk. Both jaguars and ocelots are ambush predators who frequently climb trees. Ocelots does most of their hunting on the ground, while common squirrel monkeys spend most of their time in the trees and rarely venture to the forest floor. Despite this, ocelots commonly prey on squirrel monkeys. Common squirrel monkeys may be vulnerable do certain predators, but they are not entirely defenseless. Some squirrel monkeys benefit by associating with groups of larger primates for protection. In general, common squirrel monkeys live and sleep in large troops of up to 100 individuals, providing strength in numbers. They spend most of their time in the middle canopy of the rainforest, offering protection both from predators prowling the forest floor below and raptors scanning the skies above.